JCSM audiences have enjoyed the series as a part of the Susan Phillips Gardens since 2015. JCSM acquired the Carolina Parakeet as part of the permanent collection with funds from the Miller Audubon Endowment. 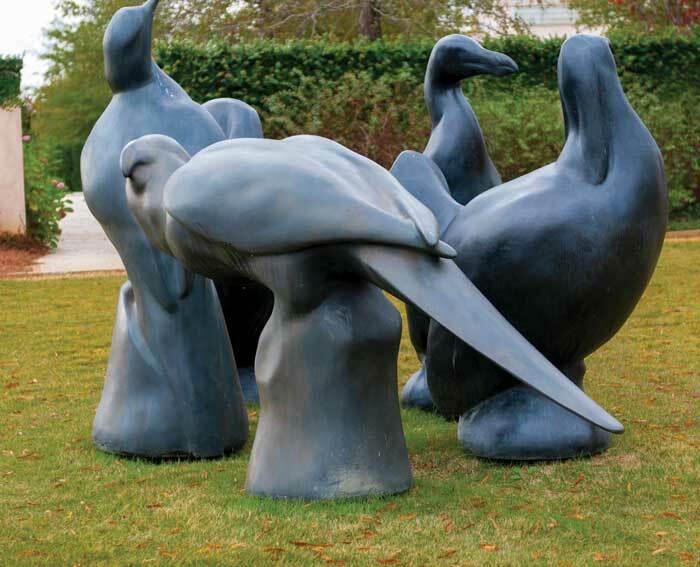 As JCSM raises funds to keep the remaining four bronze sculptures as a part of a permanent sculpture program, learn more about the inspiration for the artist’s interpretation of creatures lost to the ages. Its vibrant flock brought a moment of colorful paradise when the Carolina Parakeet populated the United States’ East coast. Their green 12-inch body thrived in the Southeastern warm oak forests in the summer as well as the bare winter trees in the North. Throughout their travels, the Carolina Parakeet was known for forming close bonds with their flock until they were killed for eating from farmer’s crops. The early 1900s saw the last population of the only parrot ingenious to North America after the parakeets were hunted for their exotic feathers and struck by disease. The last known speciman of this bird was killed in Okeechobee County, Florida, in 1904. But the last captive bird–a male named Incas, died at the Cincinnati Zoo, 100 years ago on Feb. 21, 1918. JCSM is proud to have this addition to our outdoor sculpture program and hope to raise additional funds on Tiger Giving Day, Feb. 21, 2018 to keep the spirit of the Lost Birds alive!